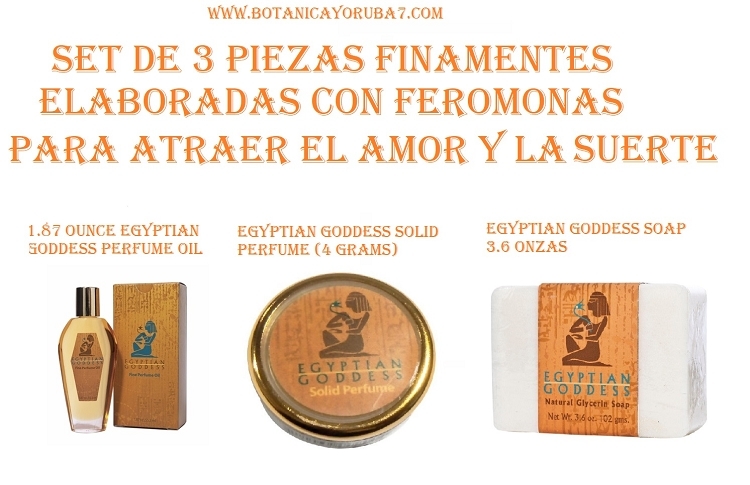 Feromona...Egyptian Goddess Bottle Fine Perfume Scented Oil 1.87 oz , Aceite y jabon egipcio para atraer amor y prosperidadEgyptian Goddess Bottle Fine Perfume Scented Oil 1.87 oz, combines soft florals, light powder and musk to create a perfume that is seductive, feminine and enticing. Seductive and soft, this fragrance blends musk with soft floral notes and powder. Bar of soap weights 3.6 Oz or 102 gms. Egyptian Goddess is an incomparably soft, delicate musk fragrance. This creamy perfume solid comes in a new convenient portable container, so your customers can take their perfume everywhere they go. This plastic container holds 1/5 of an ounce, and the gold cap screws on and off securely.